Joe Strummer's Life After Death They were called "the only band that matters." In the late 1970s and early '80s, The Clash pioneered punk rock — then went on to expand its possibilities in witty songs that critiqued the world. Strummer, the group's lead singer and songwriter, died 10 years ago this week. Joe Strummer performs with his solo project, The Latino Rockabilly War, in 1989. The Clash frontman died of heart failure in December 2002. The world has been without Joe Strummer for a decade. The co-founder and lead singer of The Clash died Dec. 22, 2002, of an undiagnosed heart defect at just 50 years old. Yet even his most topical songs continue to resonate. "There's a warmth to the Clash's music which I think is part of their great appeal," says Chris Salewicz, author of a 600-page biography called Redemption Song: The Ballad of Joe Strummer. "There's actually great melodies, and there's a great immediacy about it, combined with Joe's lyrics," Salewicz says. "People talk about The Clash as a political group. ... I saw them as a satirical group. Their function was really like something like the underground press used to be, to point out, to make fun, really, of institutions and authority." In an interview not long before his death, for the documentary Westway to the World, Strummer said much the same thing. "Politically at that time with Thatcher in Britain, and Reagan in the White House, it wasn't looking too great for the left," Strummer said. "And we were always on the left. But, having said that, we didn't have any solution to the world's problems. I mean, we were trying to grow up in a socialist way to some future where the world might be less of a miserable place than it is." 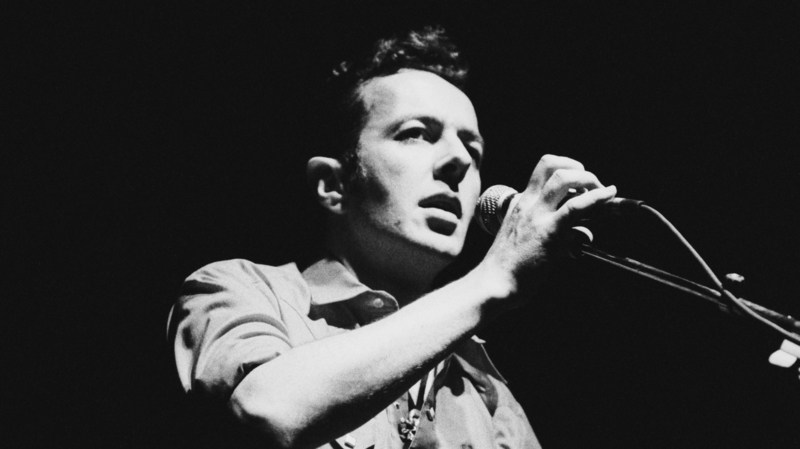 Joe Strummer came from a middle-class background. Born in Turkey in 1952 and the son of a British diplomat, John Graham Mellor changed his name to Joe Strummer in his 20s as a joking reference to his self-taught guitar style. He started forming political opinions early, as a student at the London boarding school he was sent to at 9 years old. "Authority is supposedly grounded in wisdom," Strummer said in Westway to the World. "But I could see from a very early age that authority was only a system of control. And it didn't have any inherent wisdom. I quickly realized that you either became a power or you were crushed." Strummer was sometimes criticized as an underclass wannabe. But Salewicz says Strummer came by his beliefs honestly, after dropping out of art school. "He only did the first year. And then he becomes a squatter, squatting in unoccupied houses. And I think that's a kind of great leveler," Salewicz says. "He was given a lot of left-wing indoctrination by various squatting kings at that point. But I think it's a very democratic society. Everyone really is the same ... because they're having a really hard time. They're reduced to the real ocean floor of society." The Clash's first single, "White Riot," released in 1977, was a call to white youths to rise up in protest, the way Strummer felt that black youths in the U.K. were already doing. Strummer's social consciousness continues to incite musicians today, including Bruce Springsteen, Green Day, U2 and The Wallflowers. In the 2008 song "Constructive Summer," The Hold Steady shouts out its hero: "Raise a toast to Saint Joe Strummer!/I think he might have been our only decent teacher." "The Clash seemed like real people, and they were for the people, and that was obvious," says Tad Kubler, lead guitarist of The Hold Steady. "[Strummer] had a real signature style, not just of playing, but the physical element of it too," Kubler says. "It was always moving. His sense of tempo — meter — was phenomenal." Referencing the insistent dat dat dat dat rhythm of the song "London Calling," Kubler says, "If you look at him, that's not what he's playing on guitar, that's what he's doing with his body." Written following the Three Mile Island nuclear accident in 1979, the message of "London Calling" echoes in today's concerns about climate change: "The ice age is coming/The sun's zooming in/Meltdown expected/The wheat is growing thin." Speaking with NPR in 1999, Strummer said he just wrote what he had to. "My face is very deep in the mud," he said. "I can't see the trees or the woods or the valley or the hills. You can only follow what's on your mind. In fact, a song is something you write because you can't sleep unless you write it."